The Audix MB5050-HC package includes the Audix MICROBOOM-50 Boom System fitted with an Audix M1250B-HC Hypercardioid Mic capsule. The MICROBOOM-50 is a simple-to-use modular system that can be used with a choice of capsules in the Audix Micros series, offering a broad choice of pick-up pattern and frequency response. The MicroBoom-50 System is a problem solver for many hard-to-reach miking applications including choir, plays, and orchestra. It is 50 inches long and is made from a strong, lightweight carbon fiber. High quality shielded cable is used internally to insure the cleanest audio signal path between the microphone and the bottom of the boom, which terminates in a mini-XLR male connector. The stand adapter designed for the MicroBoom allows for total control over the angle, rotation, and position of the carbon fiber rod. A metal thumbscrew locks the rod firmly in place. 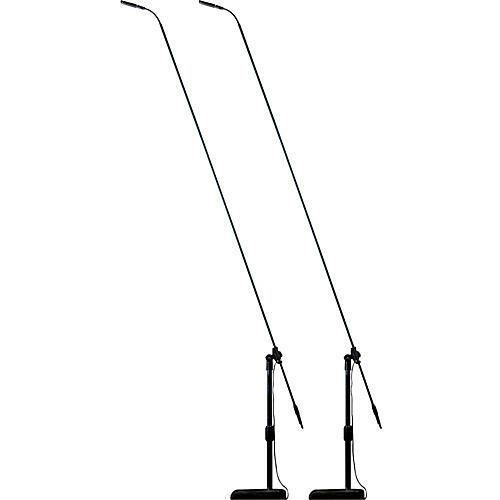 The angle and position of the microphone is controlled using the flexible metal gooseneck below the microphone. The MicroBoom-50 provides an ultra-clean, professional, and elegant appearance on stage while providing exceptional performance and portability. The M1250B, a miniaturized condenser microphone with a fully integrated preamp and detachable cable, has complete immunity from RF interference caused by cell phones and GSM devices. The M1250B-HC, which is equipped with a hypercardioid capsule that can be used in a wide variety of live, studio and broadcast applications. The M1250B-HC is available with a wide array of clips and accessories allowing the microphone to be used for drums, percussion, musical instruments, overhead stage miking, podiums, conferences, and presentations. One year parts and labor warranty (if no signs of abuse) on all mics.